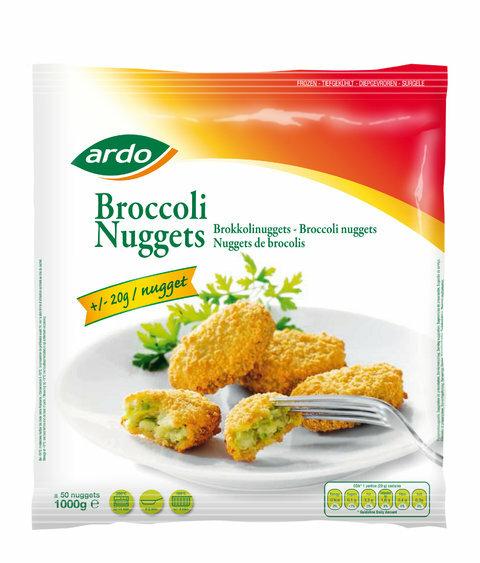 The 20 gram 'finger food' vegetable snack made from broccoli and cheese enveloped in a crusty panade. Delicious with a spicy dip sauce. Broccoli (34%), cheese (13%), bread crumbs (wheat flour, water, yeast, salt), sunflower oil, leek, cream, dried potatoes, water, egg powder, skimmed milk powder, wheat flower, vegetable stock [salt, dextrose, vegetable juice concentrate (carrot, onion, leek, shallot, pepper), yeast], maize starck, iodised salt (salt, potassium, iodide), white pepper. Fry the product with 3 table spoons of oil for 4-5 min. turning occasionally. Place the product in a single layer on a bakingsheet. Bake in a preheated oven 200°C for 6-7 min. until golden, turning once.